Anyone else remember the Coke commercial that had that song in it? How many of you can still sing it word for word? Lol. As advertising goes, that one was classic. I have been a fan of Coca-Cola for just about my whole life. Oh yeah, I cheated every once in a while and tried “that other brand” but I always came back to Coke. It was always a very brief, based on desperation sort of flirtation. The other colas seriously don’t measure up for me. I remember one day, my brother Steve and I were downtown (from Chicago originally remember) and there was a stand set up to do blind taste tests of Coke and ahem… THAT brand. We both tried it and Coke won with no problem. My Coke Rewards , I was totally thrilled. I had seen many recipes over the years using Coke as an ingredient, but to be honest, the idea always seemed strange to me. Not anymore. I won’t say that I will suddenly have up 400 recipes utilizing Coke, but you’d darn well better believe that I will recommend trying it in this one. 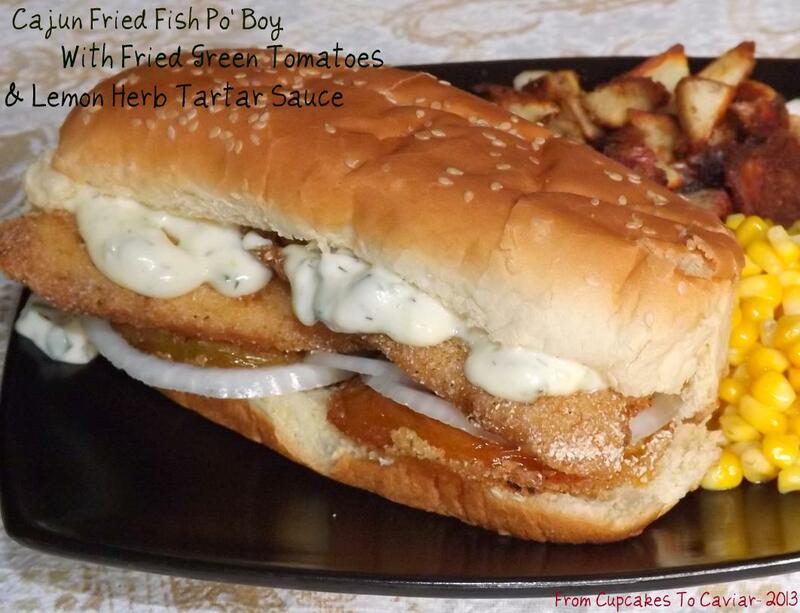 Even though I put my own twist on this recipe, Chef G. Garvin is still my new hero when it comes to pork tenderloin. Start by mixing all the seasoning for the pork. Rub the pork well with some olive oil then rub it all over with the seasoning mix. Place on a medium hot grill and cook for 8 to 10 minutes or until the temp registers at about 135 degrees. At that point, start basting with the bbq sauce, rotating the meat to help caramelize the sauce and make it stick. Cook until the meat reaches an internal temp of 145 degrees, then remove from the grill and set aside to rest before slicing. Add the canola oil to a medium saucepan. Add in the garlic, onions, shallots and curry paste. Saute until the onions are softened and tender. Compensation was provided by Coca-Cola, but Coca-Cola is not a sponsor, administrator, or involved in any other way with this post. All opinions expressed are my own and not those of Coca-Cola. Before I even get to today’s post, I want to say thank you to everybody who commented on yesterdays post or sent me emails. You have no idea how much your support means to me… to US. We still don’t know what will happen but after talking to Jordans therapist yesterday, I am still scared but not AS scared. He was charged with assault when he was 12 in a very similar situation (over reacting school administration in that case) & was eventually found to be incompetent to stand trial and she (his therapist) feels that this one will end the same way. When he gets violent, he is so not aware of his surroundings or his own mind. So all we can do now is wait and see. And pray. I will keep you all updated. Again; thank you so so much. I adore you all! Moving on… When I was a kid, up until I was about 13, I thought meat consisted of hot dogs, my mothers garbage soup (don’t ask… it is something I prefer to forget), chicken and dumplings (that was one she cooked wonderfully!) and hamburgers. Then, a magical day occurred. One weekend, I went to visit my dad as usual. He had lamb chops for dinner and he convinced me to take a bite (not sure what I had been having for dinner). Well, it was love at first bite. My dad spoiled me rotten so even though I can’t remember it as fact, I am willing to bet that he didn’t get anymore of his lamb chops hehe. Medium rare… juicy… seasoned perfectly. My dad wasn’t a major cook but oh man could he do meat right! He is the one who taught me that meat shouldn’t be leather…aka well done. Now we all know my love for curry… and spice…and cheese. Add in my love for lamb and some cranberry sauce (yes, I know that last part sounds weird; just trust me on this one. I promise… delicious!) and I had one fantastic burger for dinner tonight! And it was easy as could be. Mix everything together, toss it on the grill or fry pan (ok, so maybe don’t toss… if you miss, it could be messy. Make that set it gently on the grill 😛 ), cook to medium well (I like my whole lamb, like chops, leg of lamb, etc, medium rare but ground lamb does better if cooked more well done. ), shove it into a pita (see instructions for tossing onto the grill 😛 ) garnish and eat. Easy huh? So if you like lamb or have just been wanting to broaden your horizons, give this a try. You’ll love it! The mix of the Greek Seasoning with it’s flavors with the subtle flavor of the curry is interesting. Get your charcoal grill going to medium high heat. If you have a gas grill, you would know better than I what temp to cook burgers at because I’ve never used a gas grill before. Shape into 3 large patties. Don’t over handle. Grill over medium hot coals until the meat is medium well; 150 – 155 degrees F. When grilling, please please please refrain from flipping burgers every two minutes. You really only want to flip ONCE. Get the first side done and when the meat releases easily, it’s ready to flip. If it sticks, leave it for a few more minutes. Take some of your lettuce and push it down into the pitas. 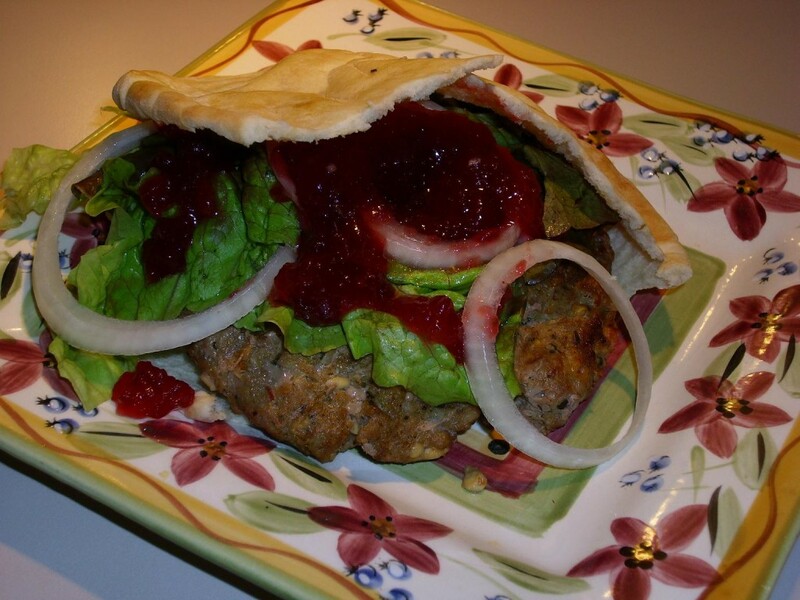 Add a burger to each pita then add a few slices of onion. Red onion tastes best but I also know that’s subjective. Either way, I had to use yellow because my red one had gone bad. Grrr… grrr I say. 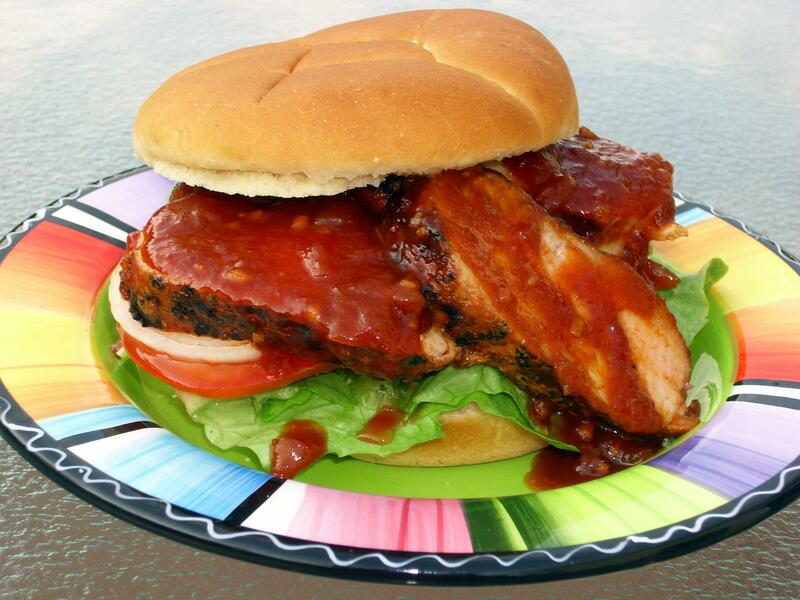 Mix your cranberry sauce with the 1/4 teaspoon red pepper flakes then spoon about 1/4 cup of it onto each burger. Again; trust me on this. The fruity sauce with the burgers is outstanding. But you could also sub mango chutney if you want. Ok, so that doesn’t fit well with the old Howdy Doody theme song does it? But I get credit for trying right?? Right? Cause I’m adorable and all that kind of stuff. I think it has been noticed by now that I like paninis. I even like the word. It’s fun to say :-P. Not as fun however as Machu Pichu, Beijing and Monkey which are my favorite words. Ummm, yeah. I like paninis. What’s weird is that I don’t really care for cold sandwiches. I like the IDEA of them but the reality never seems to measure up. The best part always ends up being the tomato and the mayo. I guess I just don’t like lunch meats much and they are the typical ingredient on sandwiches. I like REAL meat, not something that was formed from chicken lips, cow brains, piggy paws and llama testicles and then soaked in 352 pints of a salt brine. Yes, you can now thank me for helping you to never look at your lunch meat quite the same way. So when I make a panini, unless I am in a really weird mood and needing a quick sodium lift, I use real meats… real ingredients in general. Tonight I had some duck left over from one I made the other night. I wanted to use it for something a little different and a panini sprang to mind. So duck it was. But can I leave well enough alone?? HA! Come on now, you all know me better than that! So I added Sopressata Italian salami, Havarti and Asiago cheeses and then topped it all off with a quickly put together mango-apricot chutney I spiced up with ginger and red pepper flakes. In a small pot, combine the chutney, preserves, ginger and red pepper flakes. Stir to combine and heat over medium heat until bubbly while you make the sandwich. Turn the chutney off when it is heated so it doesn’t stick to the bottom of the pan. Layer all of your ingredients except the chutney on two slices of the bread. Spread desired amount of chutney onto the other two slices of bread and make the sandwich. Cook on the preheated press, pressing down some if needed, until the sandwiches are crispy and nicely browned. 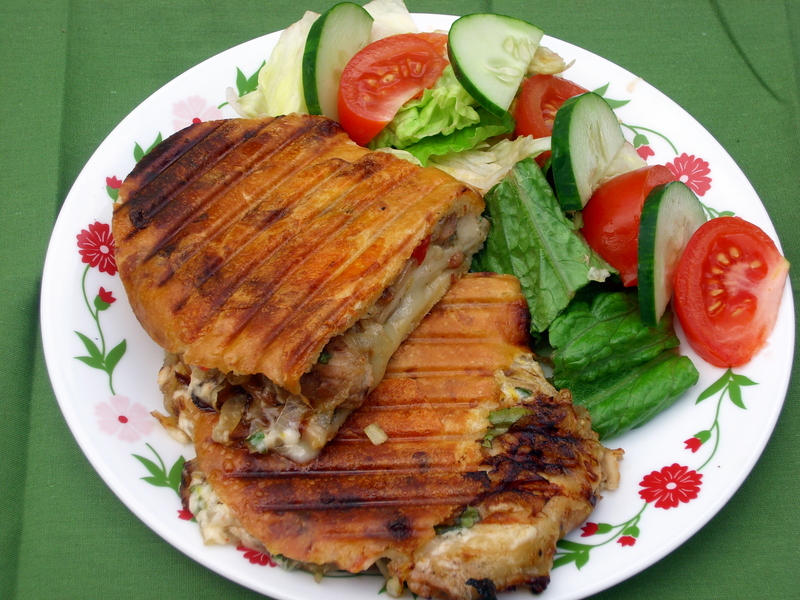 Is It Permissable To Marry A Panini? And what do I do if my husband protests the union? 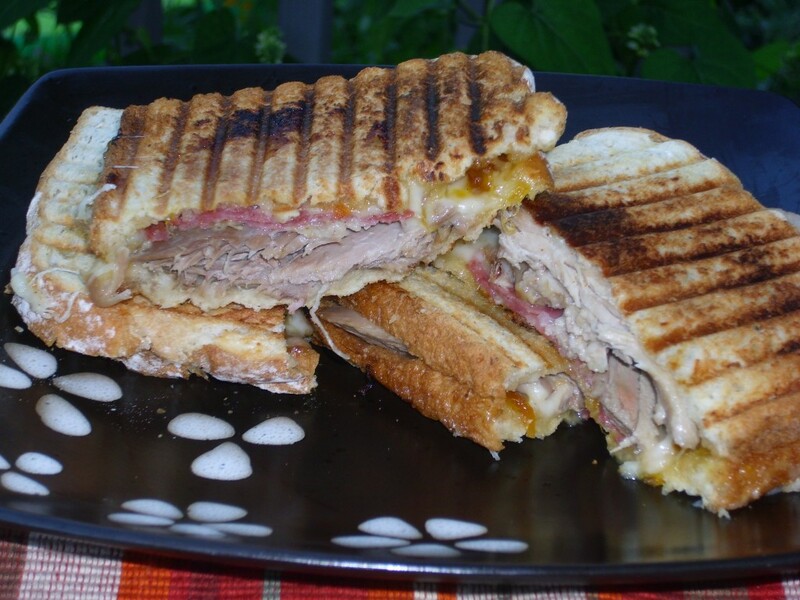 Can we all live in gooey panini sin together? How do we put the sandwich on our health insurance? And would said insurance cover bite marks in the panini? Can I be hit with domestic abuse charges for the bite marks? I don’t even want to THINK about the issues surrounding procreation and paternal rights! 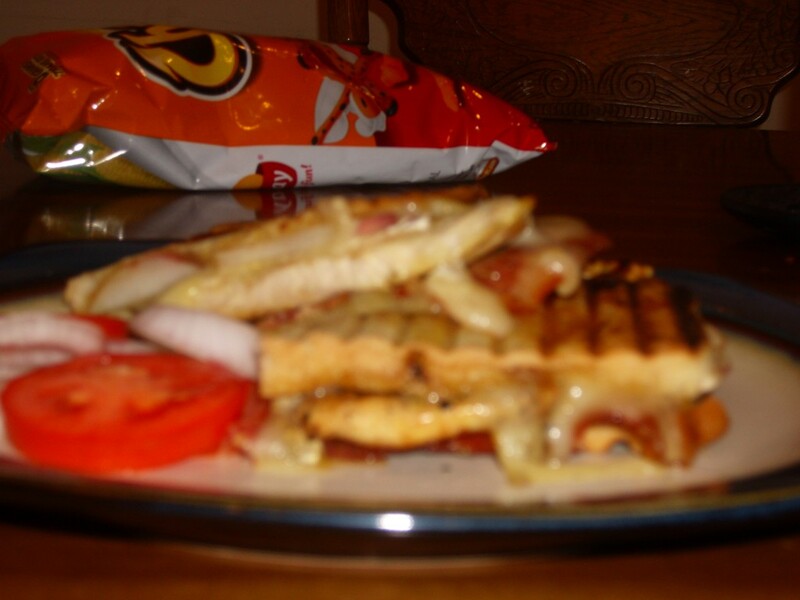 I like Paninis aka smooshed up crispy sandwiches. 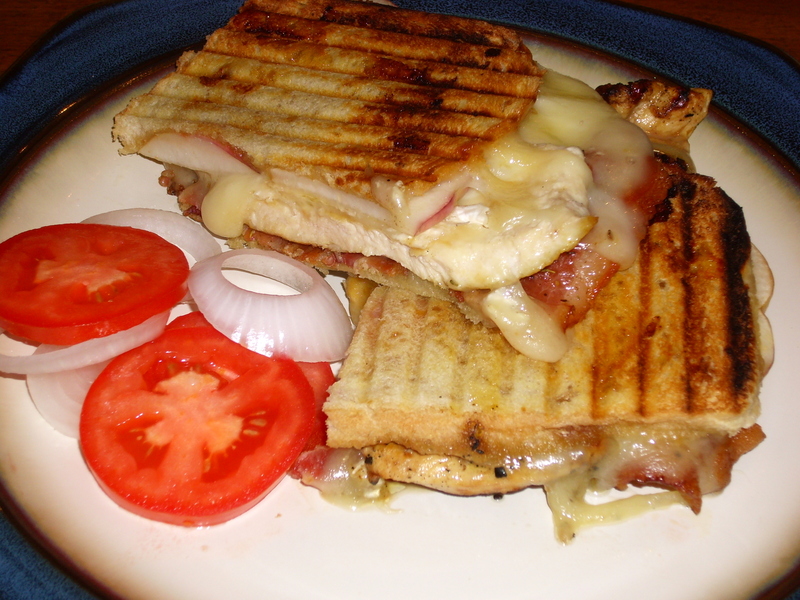 I have posted paninis before. Because I like them. I lied. No shutting up. I, like most people who didn’t live in whatever city they originated in, hadn’t heard of paninis until fairly recently. Maybe 6, 7 years ago? When I was a kid, crispy sandwiches were old fashioned grilled cheese. Preferably served with tomato soup (though I actually had never heard of that either until I got married the first time at 20). Now though, grilled cheese has given way to paninis, which, if we are to be honest, are really grilled cheese with grill marks and fancy ingredients. Not that I mind. I tend to like fancier ingredients on sandwiches. I grew up in the era of Oscar Mayer bologna, processed cheese food (you hear that Chef Dennis? 😛 ) and because I am a product of the Chicago public school system, ham sandwiches on mushy white bread that has been spread with butter. I am shamefaced as I admit to still having a certain fondness for that last one. But I love paninis. Mentioning that in case I didn’t make it clear earlier. I especially love them with “fancy” ingredients. The following is one I created tonight when I realized I had some Brie I needed to use (I ALWAYS forget it and find it somewhere in the back of the fridge and have to smack myself). I had also bought some white peaches today and had some thin sliced chicken breast to use. Add in some bacon and a couple of other assorted yummies and it made one hell of a sandwich. So go… make this. Eat. Preheat the panini press.Over medium high heat, heat a medium (lots of medium here) sized pan on the stove until very hot. Add your chicken slices, doing one at a time. Quickly cook on one side until golden brown then flip over. Sprinkle seasoning on chicken and cook other side until it is brown. It probably won’t be cooked all the way but that’s what you want. It will finish in the sandwich cooking process. Spread one piece of bread with the preserves. On top of that, layer the brie, chicken, peach slices and bacon. Slap on (yes, you have to slap it on. Just cause.) the other piece of bread. You can lightly (and I do mean lightly) butter the bread on the outside to increase crispiness if you want but really in panini presses there is usually no need. Toast…grill…cook…. 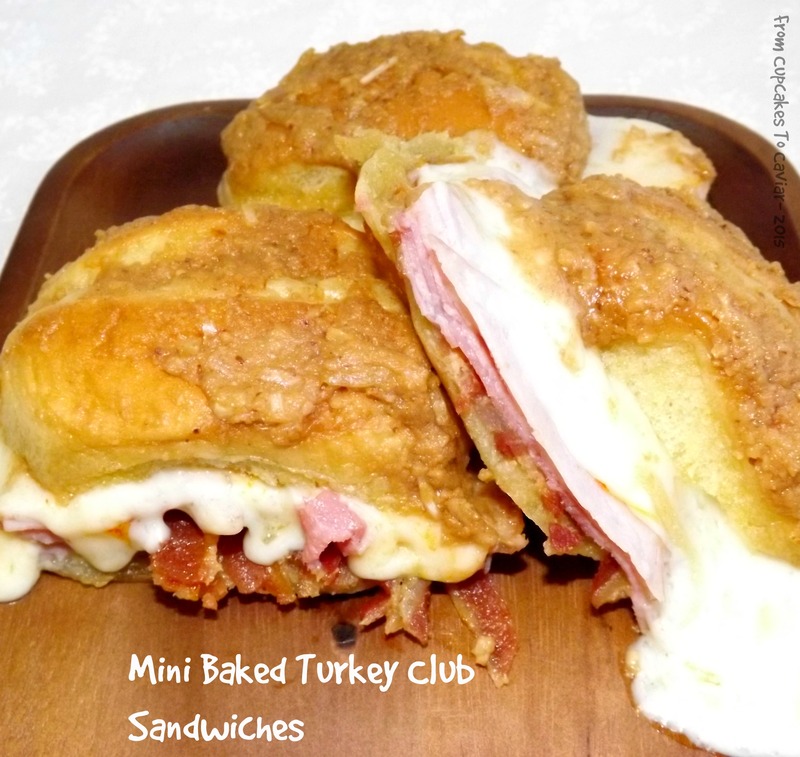 dry fry… call it what you want the sandwich until it is nice and toasty and golden brown. Cut in half and it will serve two people; one if they are starving to death. I have NO idea how my camera "messed up" and focused on that bag of cheetos in the background! I plead the fifth!! Hey there! Get me a sammich! And don’t forget the beer! Well, maybe a glass of wine or some Baileys. But make it quick! I’m hungry! And thirsty! Do you ever mentally look back at the younger version of yourself and think “OMG… what WAS I doing? What was I thinking when I did that…said that… LIVED that?” Yeah; me too. Some of the choices I made and those I let be made for me were pretty atrocious. Many that I can’t regret however. Even with two failed marriages behind me (yes, two… I was young and naive both times though I get along with both exes now; time and maturity heals a lot of wounds plus life is too short for hating) I can’t regret them because of my children. Plus, as cliche as it sounds, you grow from the stupidity. My regrets stem more from choices I made that hurt others. You know what I mean? You don’t get to middle age without having done things that made life difficult for others. What DO I regret however? I regret not going to college. I regret the times I missed with my kids when life was busy because they are the best kids on Earth. I regret letting myself be hurt by other, emotionally and physically. I regret times I have inadvertently hurt my husband because he is the best man on Earth. I regret that I don’t have a better relationship with my stepchildren though I know that is more them than me. Last (but certainly not least but I had to stop somewhere… ) I regret not having started this blog sooner because it has been a gateway to meeting so many wonderful people. Yeah, I’m lookin’ at YOU over there squinting at your computer screen. Put on your glasses for petes sake! I don’t however regret inventanating (yes, that is now a word because I again said so. I like having the “Janet Vocabulary”) this panini (aka Smooshed Up Sandwich). It is quite tasty if I do say so myself. When we grilled last night, I also made some boneless skinless chicken thighs (yes, you can sub chicken boobies in here. I used thighs to maintain moistness if reheated) to try to play with. Ok, that sounds wrong on more levels than I want to contemplate. I wanted to make them so that I had some meat to work with later. I WANTED SOME CHICKEN TO MAKE THINGS OUT OF!! This is pretty versatile. You could use chicken breast, a sliced up rotisserie chicken, different bread, what have you. The only components you would need to keep the same to have the same basic sandwich is the aioli and the specific cheese (though if you absolutely hate Brie just use another soft creamy cheese). But I’m going to post it the way I made it and the version that my husband gobbled up. Also, if you don’t have a panini press, you can make this in a non stick pan by pressing down hard on it with a heatproof plate using a pot holder. The effect isn’t quite the same but it works. Make the aioli- mix the mayo with the sun dried tomatoes, basil, garlic, lemon zest and lemon juice. Refrigerate for about an hour so so to let the flavors blend. Make your caramelized onions- put your sliced onions in a pan with the olive; stir to coat. Over medium heat, cook the onions until soft and limp. Turn heat to low (about 3 to 4), add salt and slowly cook until golden brown, about 20 minutes. Stir in the balsamic vinegar if using. You’ll have extra onions; just put them in a covered container in the fridge and save for another time. Slather the inside of one half of the roll with the aioli. Layer on the chicken, caramelized onions and cheese. Put in a preheated panini press and press down hard. I had to hold one side in with the side of a butter knife to prevent it from sliding out at first because it’s a thick sandwich. Press down hard for about 2 minutes.